The WBC Exterior Wall Bracket Light features a die cast aluminum housing with integral hinging feature for ease of maintenance. The borosilicate prismatic glass has been optically-designed for optimum light distribution. An optional polycarbonate shield is available for vandalproof protection over the glass refractor. 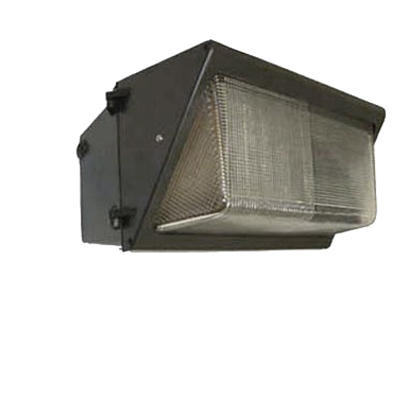 The textured anodized aluminum reflector is designed in conjunction with diffuser for maximum efficiency. Threaded apertures for conduit and optional photocell. The WBC is fully-gasketed with weather-resistant construction. Optional stainless steel wire guard and or tamperproof hardware is available for vandal resistance. Ideal for use in wattages of up to 250w to 400w metal halide or high pressure sodium. 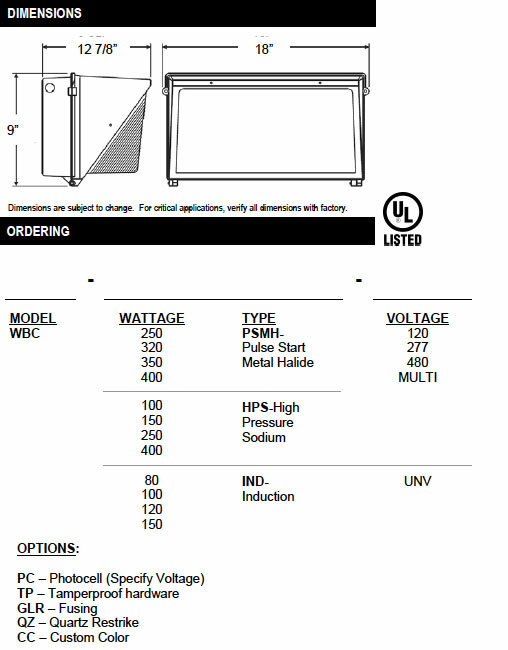 HID: Ballast is pre-wired, CWA HPF, core and coil with dry film capacitor and starter (if required). Prismatic borosilicate glass is standard.